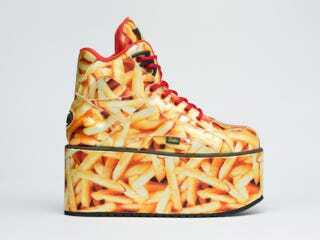 I’m tired of seeing every city person in those navy and forest green Stan Smiths, so here’s my plan for the city people: come up with some new color combos, or wear these french fry shoes. No Holds Bra Tee, $40.60 (was $58) Is this model Brittany Murphy midway through an Alicia Silverstone transformation? Is she Alicia Silverstone in the early stages of a Brittany Murphy transformation? Either way, the hair and makeup people at Nasty Gal really made this model look like Brittany Murphy and Alicia Silverstone (maybe more Alicia? ), so hats off to them. They know that we know what they're selling, and I appreciate how hard they're selling it. Shift Dress with Long Sleeve in Breton Stripe, $47 (was $68) I bought this dress, and it's the perfect base for soooo many outfits. You could do a red lip, or a yellow shoe, or a camo jacket on top, or a denim button down shirt around the waist, etc. etc. I honestly think you could wear this dress every day for a year, and people would accept the new you. Maybe they'd talk about you behind your back, but I'm sure it would mostly be compliments. Charming Heel, $39.95 (was $184.95) I don't know what you guys do for Mother's Day, but my mom and I like to party in neon shoes. Pink for her, yellow for me, shots for everybody. Leopard Sweat, $30 (was $65) You know how people say there's someone for everyone? Well there's a matching top for every cheetah twill harem pant. I haven't cleared it with Jane yet, but this is the new Millihelen uniform. Fuzzy Embroidered Satin Top, $249 (was $498) Everything else I've picked so far is mostly black & white, so I thought I'd hit ya with some navy & white that still looks like black & white from a distance. Iridescent Cell Phone Case Wallet, $11.24 (was $14.99) Comme des Garcons came out with these iridescent wallets four years ago - I didn't buy one then, but I remember thinking "one day..." Well, autumn turned to winter and winter turned to spring, and now here I am, four years later, with an $11 wristlet that looks very much like a $400 wallet. I imagine this is how TJ Maxxinistas feel all the time. Fantasy Print Pussybow Blouse, $40 (was $80) This product name is really unsettling. Maybe because it catches you off guard? Like, no one is seeking Fantasy Pussybow which is what makes it so unsettling when you find it.